PR Newswire, NEW YORK (September 7, 2016) - Orbis, the international nonprofit that unites the world in the fight against blindness, is proud to land its new, state-of-the-art Flying Eye Hospital in Shenyang, China this week to commence its first training program, running from September 5 - 23. 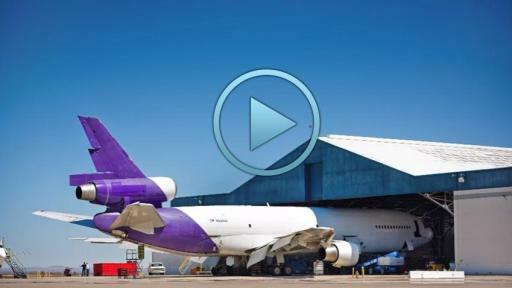 Six years in the making, the third-generation Flying Eye Hospital is the world’s only mobile ophthalmic teaching hospital on board an MD-10 aircraft, donated by FedEx. Hundreds of experts have come together to combine the latest in avionics, hospital engineering, technology and clinical expertise to make the new Flying Eye Hospital a reality. 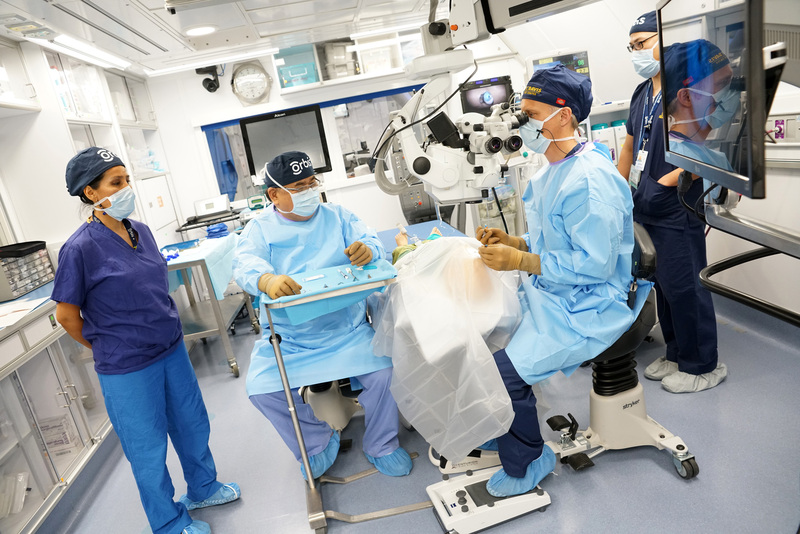 It features modular design, 3D technology and live broadcast capabilities, which enables Orbis and their expert Volunteer Faculty to train more doctors, nurses and healthcare professionals—ultimately treating more people and restoring their sight. Jointly sponsored by Alcon Foundation and FedEx, this is the first training program on our new, third-generation Flying Eye Hospital, the MD-10, which was donated by FedEx and officially launched in the United States this past June. This three-week high intensity training program has been developed with the support of the Health & Family Planning Commission of Shenyang Municipality and in partnership with the He University Eye Hospital (HUEH), and aims to strengthen HUEH’s capacity to deliver subspecialized eye care services while creating well-functioning training models (i.e. train-the-trainers) for its residents. 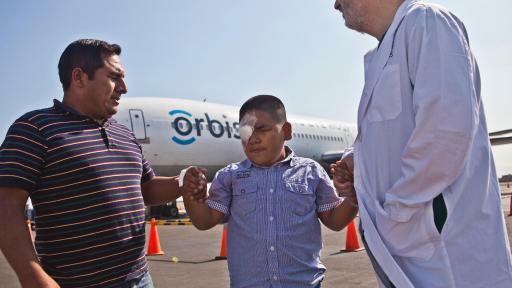 Orbis screens and treats patients on Flying Eye Hospital program. In August 2011, FedEx donated an MD-10 aircraft to retrofit the third-generation Flying Eye Hospital. This year, FedEx extends its support of Orbis for another five years through May 2021 with a $5.375 million commitment, which contributed financial, logistical, and operational support to the new Flying Eye Hospital. As a global corporate partner for over 33 years, FedEx continues to support Orbis’s mission to fight avoidable blindness worldwide. With enhanced technologies and capabilities, such as 3D filming and distance broadcasting, the third-generation Flying Eye Hospital will continue the legacy of its predecessors to provide better training experiences for local eye care professionals in China and around the world. Orbis has a long history in China, and this Flying Eye Hospital visit marks the 40th program in the country since its inception in 1982. In fact, Orbis has a 12-year partnership of blindness prevention work in the Liaoning Province, and the Flying Eye Hospital program will support the ongoing “Shenyang Training for Prevention of Blindness” project implemented by Orbis North Asia and HUEH. Nevertheless, China’s ophthalmic residency programs usually provide limited hands-on surgical training for residents, and less than a third of trained junior ophthalmologists enjoy the opportunity to perform surgery regularly after graduation. The absence of standardized training programs is a major obstacle in this process because skills-transfer is not a priority for the practicing staff. Therefore, it is quite difficult to do high quality hands-on training for rural eye doctors or ophthalmology residents in China. Additionally, a major problem in blindness prevention in China is the lack of quality eye care service and personnel in the rural areas where they are most needed. For example, according to 2008 National Eye Care Resources survey, 44 percent of eye care institutes were located in eastern China, and 66 percent of ophthalmologists were based in big or medium cities. By the end of 2012, there were totally 326 eye hospitals in the country, 70 percent of which were located in cities. The Shenyang Flying Eye Hospital program provides continuing medical education tailored for local ophthalmologists, nurses, anesthesiologists, biomedical engineers and technicians through lectures, discussion, observation, as well as the much needed wet-lab and hands-on training in seven subspecialties, including cataract, cornea, retina, glaucoma, pediatric, optometry and orthoptics. By leveraging the high-profile Flying Eye Hospital, the program also helps to advocate for the expansion of hands-on training models for county level ophthalmologists and residents in the province among key stakeholders, including the Chinese Ophthalmological Society and the national government. The launch of the third-generation Flying Eye Hospital and the three-week Shenyang training program would not be possible without the tremendous support of our global corporate partners, i.e. Alcon Foundation, FedEx, Jebsen, L’Occitane and OMEGA, as well as our local program sponsors, including AccorHotels, Deutsche Bank, Nova Vision, SightLife and Sofitel Shenyang Lido. Orbis is a leading global non-governmental organization that has been a pioneer in the prevention and treatment of blindness for over 30 years. 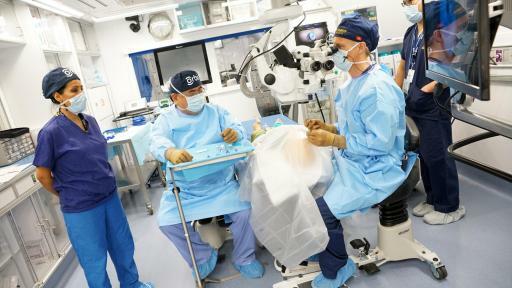 Orbis transforms lives by delivering the skills, resources and knowledge needed to deliver accessible quality eye care. Working in collaboration with local partners including hospitals, universities, government agencies and ministries of health, Orbis provides hands-on ophthalmology training, strengthens healthcare infrastructure and advocates for the prioritization of eye health on public health agendas. 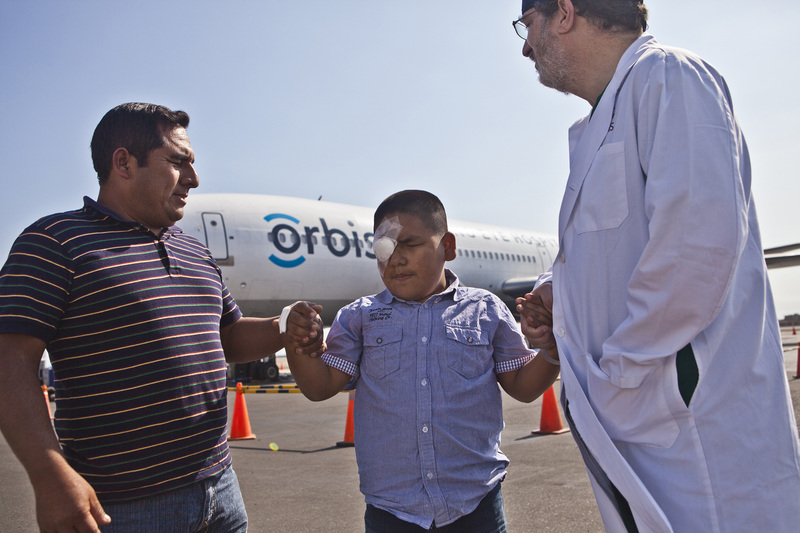 Orbis operates the world’s only Flying Eye Hospital, a fully accredited ophthalmic teaching hospital on board an MD-10 aircraft. To learn more, please visit orbis.org. 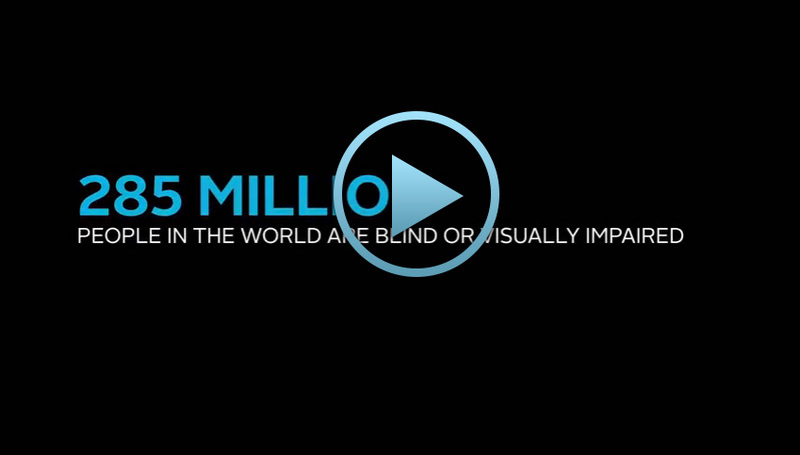 For more than 50 years, Alcon has been partnering with non-profit organizations that make a difference in advancing eye health, knowledge transfer, research and education, as well as enhancing access to quality eye care around the world. The Alcon Foundation awards grants to qualified, U.S.-based tax-exempt public 501(c)(3) non-profit organizations that provide high-quality programs, trainings and community services with well-defined goals to enhance sight and enhance the lives of people who otherwise would not have access to proper eye care. For more information, visit www.alcon.com. FedEx Corp. (NYSE: FDX) provides customers and businesses worldwide with a broad portfolio of transportation, e-commerce and business services. With annual revenues of $58 billion, the company offers integrated business applications through operating companies competing collectively and managed collaboratively, under the respected FedEx brand. Consistently ranked among the world's most admired and trusted employers, FedEx inspires its more than 400,000 team members to remain "absolutely, positively" focused on safety, the highest ethical and professional standards and the needs of their customers and communities. For more information, visit news.fedex.com. 2 Liang YB, et al. Prevalence and causes of blindness in rural China: the Handan Eye Study. Ophthalmology 2009. 3 Wang Ningli, et al. The Handan Eye Study: A Review. Journal of Capital Medical University. Learn who Orbis is and how to you can get involved. Learn about the new MD-10 and history of the Flying Eye Hospital.